When the Ancient Greeks, who invented the Olympic Games as an afterthought to laying the ground rules of Drama, Philosophy, Ethics, Medicine, Astronomy, et al, wanted to venture a bit of soothsaying as well, they would despatch a slave to Delphi to consult the Oracle. We slaves to track and field athletics have a much simpler task nowadays; we just log on to the internet and consult the likes of trackandfieldnews or letsrun. We can get results, reports, stats, and opinions on the state of the sport from across the world. The latter site has its drawbacks, mostly connected with its forum and message boards, where there are a few, sorry, a lot too many trolls, attention-seekers, and people who just can’t spell. I’m not going to get into to some of the more arcane areas of the recent forum debate; I just want to say that, since the Moroccan’s career took place between 25 and 35 years ago, younger readers and indeed those who were not regulars on the Grand Prix circuit where he plied his trade will simply not know the levels of excitement he engendered wherever and whenever he competed. Because Aouita was not simply a consummate competitor – who won 115 out of 119 races in close to a decade before injury halted his momentum – but he was a peerless entertainer. Aouita could talk a race as well as he could run one. I first encountered him in 1983, prior to the inaugural IAAF World Championships in Helsinki. George Gandy, who had been Seb Coe’s advisor at Loughborough University had told me how another of his world class athletes, Graham Williamson had been left in the dust by Aouita in a pre-World Championship event in Italy a few weeks before. Four years previously, Williamson had won the World Student Games 1500 metres, with Aouita finishing last. The tiny Moroccan had won the following WSG in 1981, and had obviously made even greater strides since then; and with Coe out of the reckoning for Helsinki, and Ovett coming back from injury, the third Great Brit, Steve Cram was clearly going to have some serious opposition from Aouita. Since I spoke reasonably good French, and with French being Aouita’s first European language, I went to the Athletes’ Village on the outskirts of Helsinki to track him down. He was very wary, telling me outright that he suspected me of being a ‘spy’ for the Brits. That was typical Aouita. Why believe simple journalistic interest when a conspiracy theory suited his word view better? Then there was his manager, Enrico Dionisi, a character straight out of central casting for volatile Italians. Their press conferences were like comedy routines by Groucho and Chico Marx. In contrast, Aouita’s racing style was pure class. He finished third behind Cram and Steve Scott in that world 1500 metres final in Helsinki. And despite making up ten metres in the final three hundred, he also narrowly lost one of the greatest metric miles in history, again to Cram in a world record race in Nice in 1985 (he took down Cram’s record two weeks later). His only other defeats in the next five years were in his only steeplechase (having won the 1500 and 5000 metres) in the Mediterranean Games in 1987, to Olympic bronze medallist Alessandro Lambruschini; being relegated to bronze by Olympic champions, Paul Ereng and Joaquim Cruz in the Seoul 800 metres when carrying an injury which forced him out of the subsequent 1500 metres; and an early season 5000 metres race to a later world champion at the distance, Yobes Ondieki, in 1989. Among the other 115 races that he won between Helsinki 1983 and midsummer1990, when he had to have an operation on both shins for ‘compartment syndrome,’ were an Olympic title at 5000 metres in Los Angeles 1984, the world 5000 metres in Rome 1987, the world indoor 3000 metres in Budapest 1989; and concurrently holding the world records for 1500, 2000, 3000, Two Miles (world best) and 5000 metres, the last which he broke twice. 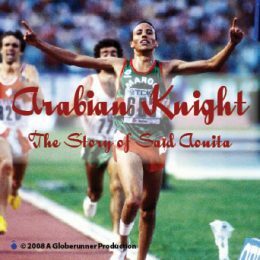 But if anything defined his ambition, even though he failed in the attempt, it was the courageous (and outrageous) decision to go for an Olympic 800/1500 metres double in Seoul 1988, having won the 5000 metres in the previous Games. He remains the only man to win Olympic medals at 800 and 5000 metres. And adding to the entertainment was his refusal to acknowledge defeat. The above mentioned George Gandy once said of Ovett, ‘You might beat Steve, but he never lost’. Aouita picked up that baton and ran with it. Exasperated after the Olympic 800 metres final in Seoul, he spotted me at the post-race press conference and said, ‘If that race was re-run right now, I’d win’. Well, yes, I replied, but….. Similarly six months later, after losing by the length of the finishing straight to Ondieki in a 5000 metres in Seville, he claimed he thought the Kenyan was a pacemaker who’d dropped out. You could only laugh at his bravado. Even when an injury, followed by an operation put paid to his career, it took a few losses to persuade him to retire, following which he became Moroccan national coach. When the inevitable bust-up between this self-willed man and federation officials happened two years later, he started training again, at 34. And, even past his best, my Canadian colleague Paul Gains, who was putting together a field for an indoor race north of the border in 1994, leapt to sign on Aouita, saying, ‘Since he retired, there’s been no one remotely as exciting as Aouita. He’s still a big draw’. As he had been for the whole of the previous decade. There was no one like him. 27:26 in his one and only 10,000m — at a time when the WR was 27:13 — you have to think that he had a 27:12 in him at least. There was a question mark; but I should have made clear that the title is a reference to the debate on letsrun! I was a teenager in the 80’s and he was my favourite athlete by far. It’s still unthinkable that a 5000m runner would attempt the Olympic 800m – and he almost pulled it off. Not only can’t they spell, but a good number of the ‘LetsRun’ trolls can’t read either !! Example: after Bolt was quoted as “having done everything I wanted in the sport” it became “has he done everything in the sport” on the message boards! Correct year of his World Student Games 1500 meters victory was 1981. It was in Bucharest, Romania and after finishing 4th and running one of my more stupidest races by being in 10th with 300 to go, I asked Marc Nenow (later USA 10,000m American Record holder) and John Gregorek (he won the steeple in Romania) who won, they replied “Some guy from Morocco!” I could not believe the German, English or other runner had not won. But the page had been turned: Said would lead the dominance of the African distance runners to this day. Good to hear from old friends and world class runners. Thanks to Jim Spivey for pointing out that A’s WSG victory came in 1981 (not ’91, as I had it). And I love the ‘Some Guy from Morocco’. Had I heard that before, I’d have used it as a headline! Great piece Pat, and yes many an armchair distance runner come world recordholder on Letsrun forums whose comments make clear their distinct lack of knowledge, understanding and experience in the sport, but I digress. I too grew up as a young athlete in the late 80’s and early 90’s watching a steady diet of Said Aouita races as he attacked his races on the Grand Prix circuit with his silky smooth stride (all legs), head bobbing and arms pumping hard with the grimace (sometimes eyes closed) as he pushed all the way through the line), we were never in doubt at his 110% effort in every single race with him leaving it all on the track. I remember watching his gutsy effort in the 1988 Olympics over 800m which put paid to certain 1500m gold and the sprinting talent of the 20 year old Paul Ereng’s afterburners in the last 100m left him to duke it out with Peter Elliott of the UK. Aouita was my favourite and would certainly go down in my book at the GOAT. Time for you to do a book on Said Aouita, Pat? Have really enjoyed your other books on Zatopek, Ali Mimoun and The Perfect Distance.